More threats, hostility and uncertainty are on the way; rivals are likely to up the ante in the days to come. 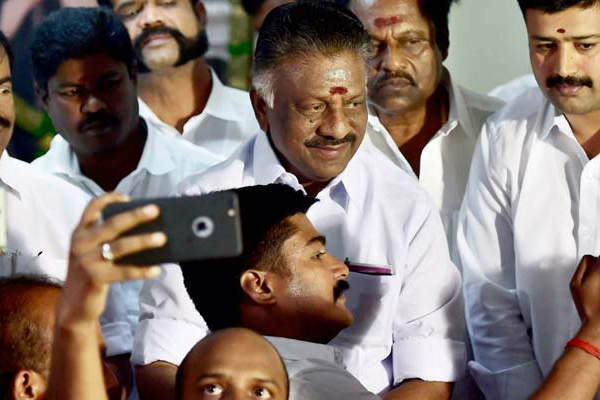 O Panneerselvam's loyalty and devotion to the late Tamil Nadu CM Jayalalithaa is reminiscent of Bharat's loyalty and devotion to Lord Rama in the epic Hindi story of the Ramayana. While Bharat ruled the kingdom of Ayodhya when Rama was banished to the forests by placing his slippers on the throne and himself taking a different seat, Panneerselvam, when he was called upon to stand in for Jayalilathaa when she was hospitalized, not only refused to take her seat but also refused to operate from her office even as he handled all the eight portfolios that Jayalilathaa was in charge of. He wept openly at the demise of Jayalalithaa. It was only logical, then, that he would be asked by the party to take over as CM after the death of Jayalalitha. However, there were people in the ranks who favoured Sasikala, Jaya's old time friend and confidant, to take over as CM, but the fact that she had never held a political office probably went against her. And therefore the job went to Paneervelsam, who began his career as a tea stall owner like PM Narendra Modi. Ganesha feels that Panneerselvam's path will by no means be smooth, and he will have to face rebellion both from within and without. In this article, Ganesha analyses the planets in Panneerselvam's Oath-Taking chart and the impact they will have on him and his government in the near future. Moon is placed in the star of Mars and is afflicted by Ketu in the 6th House, which indicates that though the party has tided over the immediate crisis after Jayalalitha’s death, the questions regarding the longevity, popularity and stability of the government will still remain bothersome for the new CM of Tamil Nadu, O Panneerselvam. Adding to this, the Sun is placed with Saturn. So, the threat of its rival, the DMK would loom large. This combination also indicates that the grass-root level political leaders might try and arouse casteist feelings and that might weaken Panneerselvam’s hold on the administration. However, the Lord of the Ascendant Mercury is placed in the 4th House and is in exchange with the mighty Jupiter which will help the new CM to consolidate his position. It will also provide Panneerselvam the necessary breathing space and will help in negating any possibility of a split in the party in the near term. Get answers and effective solutions to your career issues with the help of the report Career Ask A Question. He will try to bring all the party leaders under one roof. The 'all-inclusive' and 'walk together' approach will OPS to keep the party members to stick together as a unit. His strong administration abilities along with a flexible approach towards his opponents within the party may help him to overcome any immediate threats to his government. Currently, the Sun is transiting through the Sign of Aquarius and is in conjunction with Ketu. This transit will remain extremely critical for his government. Adding to this, the Sun-Mercury-Ketu conjunction in Aquarius from 23rd February, 2017, will remain adverse for his government. In this context, his government will remain under threat till 14th March 2017. Expect some sudden developments during this period, says Ganesha. Mercury is hemmed in between malefic planets, which creates the Papakartari yoga for it. This points out the vulnerabilities of his government. So, the government may look stable from the outside but will remain vulnerable to external and internal shocks. Are you seeking guidance regarding your business? Then, avail the Business Ask A Question Report now! On one hand, it is likely that the new CM will have a strong influence ons the state policies and will continue the welfare policies; and on the other hand, he will face resistance from inside and outside, while implementing his ideas and policies. Stars reveal that a huge challenge will emerge during the latter half of the year 2017. During that time, though the transiting Jupiter will help him to manage the situations, he will face considerable trouble. His tenure as the CM of Tamil Nadu will remain challenging and the period starting from November 2018 till the end of July 2019 will remain very crucial for him and there may be some uncertainty about the survival of his government. What can we write home about from the Astro-analysis? Even if his government survives, stars reveal that major challenges will emerge during the later half of year 2017. The path will become more slippery. During that time, he will face considerable trouble. His tenure as CM of Tamil Nadu will remain challenging and unstable. But, if Panneerselvam is able to wade through these sensitive phases, then he may do considerably well as the CM.